What do you do after you finish a season of Terrace House and your heart feels empty and needs to be filled with data or drama or both? What do you do if you really want to know what’s going on with the characters you either fell in love with or hated, but you feel ashamed that you’d like to keep up with their lives—not in a creepy way but out of a sense of curiosity and maybe protection? How can you be sure that they’re doing alright as real people or if the couple whose courtship happened before your eyes is still together? What do you do? In the privacy of your home or phone, maybe you Google “what terrace house members up to” or dig through Reddit. Or you do as diehard Terrace House fans do and follow the housemates on Instagram. This is my recommendation to you. However, there are only a handful of cast members whose Instagram accounts I accept into my life. I don’t need to see Shohei’s exaggerated performance faces, and do I really want to keep up with Makoto from the early, less dramatic part of Boys & Girls in the City? Not really. But I would, however, like to be AIM friends with Seina and see what Han-san is building with his handsome self these days. This isn’t an extensive list, since my taste is skewed toward Opening New Doors and Boys & Girls in the City, but I consider this to be a strong introduction to the Terrace House cast members who are most worth spending too much time with on Instagram. And since many of the cast members continue to hang out post-filming, following one of them on Instagram usually leads to finding others, so go ahead and build your own list accordingly. 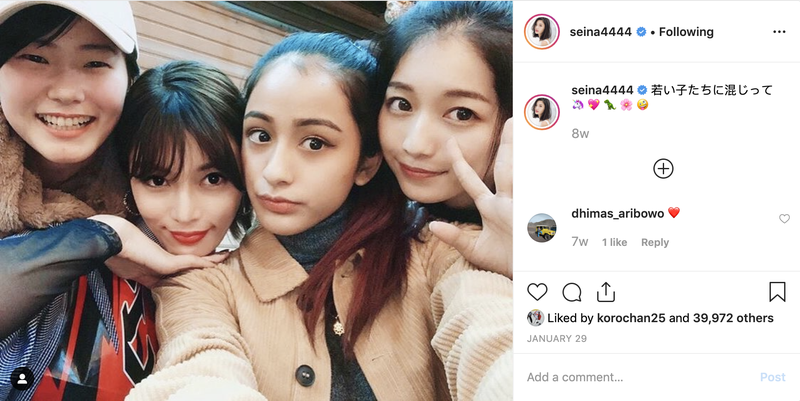 Seina’s Instagram account is filled with yoga poses, modeling head shots, influencer posts, and lots of pictures with Noah, the younger castmate with the perfect face who’s now her boyfriend. It’s good to follow an OG, because she hangs with everyone, and everyone loves her, and she’s the connective tissue of this entire franchise. To that end, Noah is worth following because he is beautiful. Now that Tsubasa and Shion have broken up, her account will no longer be a source for cute snapshots of the two of them eating or him pretending to bite her head off. As they say, life goes on. The flames of love don’t burn eternal. There he is, buried up to his chest in sand, telling us life is a beach. Again, following Shion was mostly to stay up-to-date on his relationship with Tsubasa, so there’s no telling how his account will shift, but he is still a core Terrace House member who must be tracked. Who will he be in love with next? A great human overall, Han-san was everything you wanted in a housemate, friend, and person: practical, reliable, great smile, great listener, good at making things. Best to stay abreast of whatever he’s building. Despite her lack of communication and inability to love the hottest guy in the house, Taka, it’s hard to deny Ami’s good fashion sense. Not sure what’s going on in her dating life, but her Instagram provides lots of sartorial inspiration. Something about Minori’s personality spoke to me. She was often standoffish with good intentions, and there’s the fact that she willingly consoled her then-boyfriend Uchi about his meat drama. On Instagram, she mostly posts headshots and fly outfits. On the least good season of Terrace House, Avian’s enthusiasm stood out. She loves a good nature shot and is usually just chilling in her photos, enjoying the views. Her account emits maximum relaxing vibes. As a cast member who wasn’t afraid to have real discourse and disagreements in the house, she was a literal breath of fresh air, the spark needed to light a match on reality TV. For some reason, I wasn’t following Natsumi before making this list, but now I am. Arman was quite the character and kind of like a fungus. Like Taka, he stayed in the house for too long, resigned to a life of seeking love and not quite finding it. Arman was nothing if not resilient. After his relationship with Masako bloomed on the show, I had to see if they stuck together, but it appeared that the long distance between Japan and Hawaii didn’t work out. What are the kids doing? They’re all hanging out and they’re okay. Much like other cast members, most of her photos are model shots and sponcon. But how could you not follow the person involved in the biggest scandal in Terrace House history? Look at this, it’s a duck sitting on top of a bear. I’m not, but you could also follow Hayato, the other half of the biggest scandal in Terrace House history, because it seems he’s kept up his relationships with housemates. Look at that drip. I mostly follow Masako for the amount of swagger she delivers. He may have overstayed his welcome by the end of his season, but come on, he’s hot. Easy follow. Lauren’s Instagram promises lots of fun, provocative drawings and updates about her travels. She’s also Doing Big Things. Okay, despite what I stated at the beginning of this post, I went ahead and followed Shohei while writing this. Why not. Taishi is not the most favorable character, but he was a character. Idealistic. Theatrical. Extra. Seemed like someone I should keep up with to see how his desire to find everlasting love was working out for him. It’s going well. He and Chikako are going strong. In fact, the two are reportedly engaged, and he made a whole video about it. Look who it is. Both Yui and Aio post regular photos of each other on IG, just in case you were wondering how the sock saga continued. And that’s the list. The former housemates most trying to live, trying to hope, trying to love, trying to cope—on Instagram.